Karaugh Brown's first album was born one early and warm January 2000, in Philadelphia. Brown released Dresses and Dirt that spring on her own label, One Room Records. 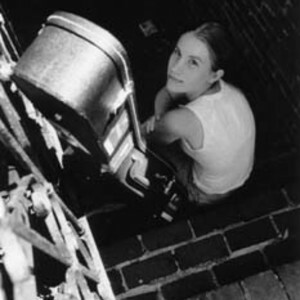 The EP earned her support slots with Melissa Ferrick and Dan Bern, and brought her to the attention of the Boston folk scene, which she calls home. In the late summer of 2000, Karaugh met Grammy-nominated folksinger, Bill Morrissey at Club Passim, in Cambridge, MA. In the late summer of 2000, Karaugh met Grammy-nominated folksinger, Bill Morrissey at Club Passim, in Cambridge, MA. Morrissey called her, after listening to her songs, and offered her openers on his upcoming shows. In January 2001, Morrissey made a second offer: to produce Brown's first full-length album. Morrissey brought Billy Conway (Morphine, Twinemen) onboard as engineer and drummer, and the three went into the studio in the spring of 2002. In the midst of this recording she was nominated for a Boston Music Award and invited to showcase on the main stage at the 14th Annual Falcon Ridge Folk Festival. One Round Orange was released in October 2002 to critical praise in publications like Sing Out!, Performing Songwriter, Boston Globe and Boston Phoenix. As a result, Brown was invited to contribute one of her songs to Signature Sounds' Respond II compilation, which included such luminaries as Suzanne Vega, Joan Baez, Ani Difranco and the Indigo Girls. Respond II was released in January 2003. Karaugh Brown is currently in the studio working on her second full-length album, Favorite Daughter. She is joined by Billy Conway, who returns as co-producer. Sean Staples is back on mandolin and electric guitar, while newcomers Rob Laurens plays bass and Dave Westner (Jabe) plays drums. The album will be released in the fall of 2005.